I am hopeful that games will get underway this weekend and would like to thank students and their families for their assistance and patience with the Co-curricular program. Given that there is extreme heat forecast for this weekend, I wanted to remind families of the SAAS heat policy and the fact that cancellations will be published on the Rostrevor website. Cancellations: Middle and Senior Years training will be cancelled if the forecast temperature is 38 degrees or greater. Junior Years training will be cancelled if the forecast temperature is 35 degrees or greater. Weekend games will be cancelled on the Friday if the forecast temperature is 38 degrees or greater. Please check the section on the Rostrevor website under Co-curricular Late Cancellations if you are unsure about a change in the program due to weather. A very disappointing way to begin our season given the expectations we set ourselves going into the State KO Fixtures. Westminster won the toss and elected to bowl on a good wicket and from the outset, they hit the right areas with the ball, with some of our top order unable to cope with the quality of the bowling. Some poor shot selections were also to blame for an early collapse which left us at 3/9 which was always going to be difficult to come back from. There was some resistance from newly appointed captain Murphy Short (31) and second gamer, Year 9 Sam Rahaley (38) who both batted well but we really needed one or both of the boys to go on and make scores of 60+ to be competitive. Our score of 122 was always 30 to 40 short and so it proved. Rahaley deserves a lot of credit for his innings. It showed great maturity, coming in at a difficult time but still showing the intent necessary to keep the scoreboard ticking over. For a lad of his age, this was exceptionally pleasing. In reply, our openers didn't hit the mark from the word go and allowed the Westminster openers to bat the first seven overs without loss. From that point on, wickets fell regularly as we found the line and length required at this level. This consistency of bowling is what we need to see at all times, not in parts. In the end, we gave Westminster a bit of a fright, but our total was never going to seriously challenge a batting line-up like that in good conditions. The Open A Tennis team had a great match against St Peter's on Saturday, narrowly going down 5-4. Best performances for the team were Oscar Walters who had a strong 6-2 singles win and Anthony McCarthy who won his singles 6-3. Congratulations to Year 12 Hugh Walker who made his A Grade District Cricket debut for Woodville earlier in January and has managed to hold his spot in the side. Rostrevor students, Samuel Cirocco, John Difede and Gianni Bergamin were an integral part of the inaugural U/14 Adelaide Futsal Club team (THE LIONS) which won the SA FUTSAL LEAGUE Championship held at Gepps Cross Velodrome from September through to the Finals in December. 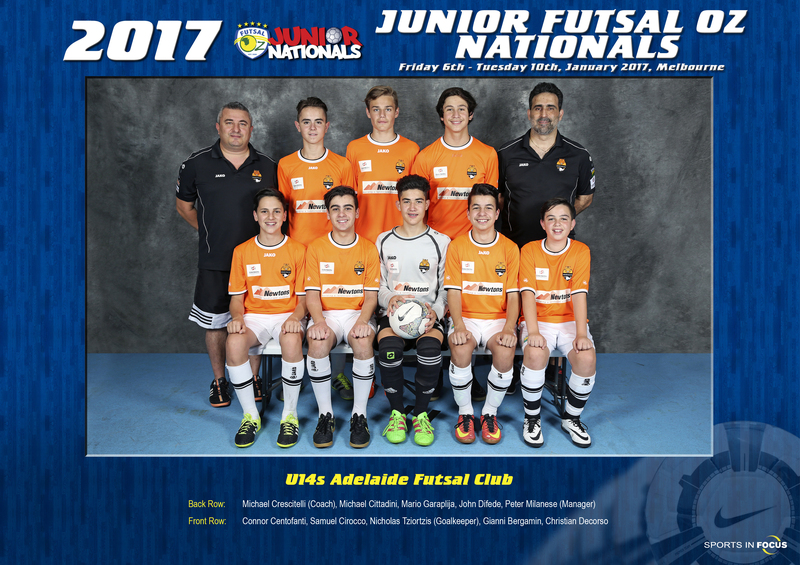 This same team was then selected to represent the club at the FUTSAL OZ NATIONAL JUNIOR CHAMPIONSHIPS held in Melbourne in January. They were the only South Australian team in the hotly contested under 14 division. At their first ever National tournament the team performed extremely well going undefeated for 10 games and eventually only losing the Grand Final to a well-seasoned club from Brisbane. The boys played with the "hearts of Lions" and conducted themselves with great sportsmanship and dignity. Attributes which are befitting of Rostrevor students. If your son, be he a current or old scholar, has made any significant achievement in an activity outside of the College, please pass this on to me via email to jfischer@rostrevor.sa.edu.au or by phone, so that I can include his achievements in the weekly newsletter.